NASA has announced the funding of a new research effort that will explore the possibility of using robot bees to study the Martian surface. NASA has appropriately called the concept the Marsbee, and the team hopes to develop a model that is capable of navigating the thin atmosphere of Mars in swarms, gathering information with various sensors. “The objective of the proposed work is to increase the set of possible exploration and science missions on Mars by investigating the feasibility of flapping wing aerospace architectures in a Martian environment,” explains University of Alabama researcher Chang-kwon Kang in a statement. A research team at the University of Alabama will work in collaboration with an as-of-yet unannounced team in Japan to create what may be a more efficient means to explore Mars. While the Mars rover has proven to be a reliable exploration machine, it does suffer from slow speeds. A swarm of robotic bees would not have this problem as it scours the surface of the Red Planet. The body of the Marsbee would be similar to that of an actual bumblebee, while its larger wings will be about the size of a cicada. Researchers are currently exploring the most effective mode of flight, whether flapping through flapping, fixed-wing or rotor. The collaborating group of Japanese scientists has already created their own wing-flapping robot, the hummingbird micro-air vehicle (MAV). The Marsbees would be bound to a mobile “hive,” in the form of a traditional rover. 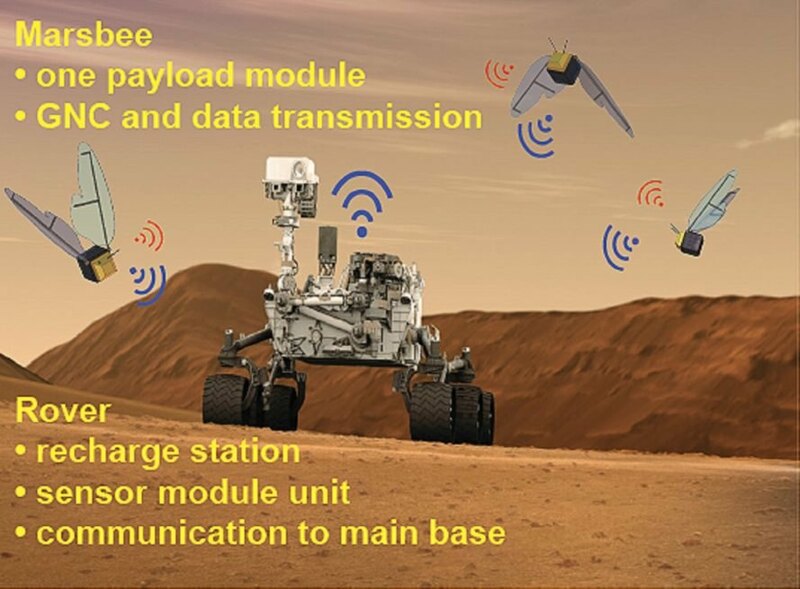 The rover would serve as a home base at which the Marsbees would recharge and store data. The Marsbees would also be capable of sending information whilst in-flight through Wi-Fi technology. The Marsbee is still very early in development. NASA expects feasibility studies to last a decade before the project moves onto Phase II. 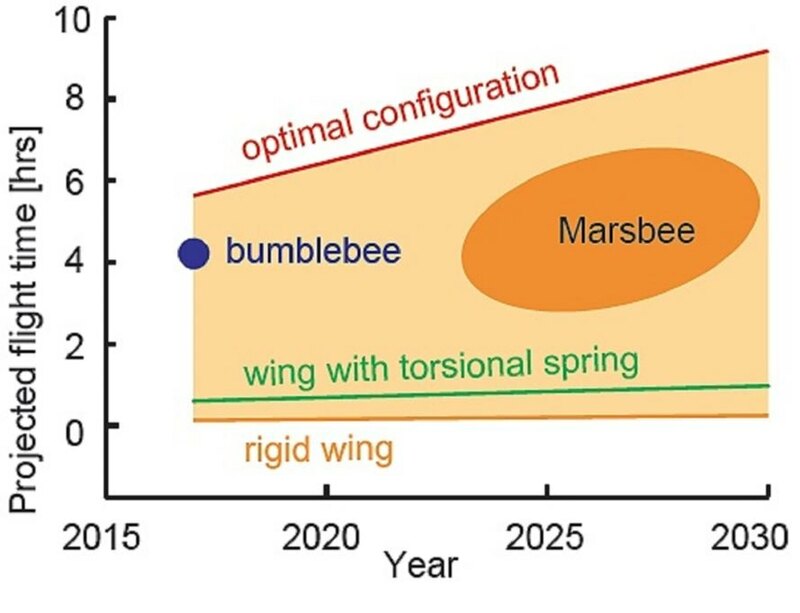 The challenges that must be overcome before the Marsbee takes flight include designing a potentially autonomous navigation system, determining flight style, and inventing a means to keep dust out of the Marsbee. The Marsbee swarm flying in tandem with a Martian rover. A chart projecting the potential future for the Marsbee project.